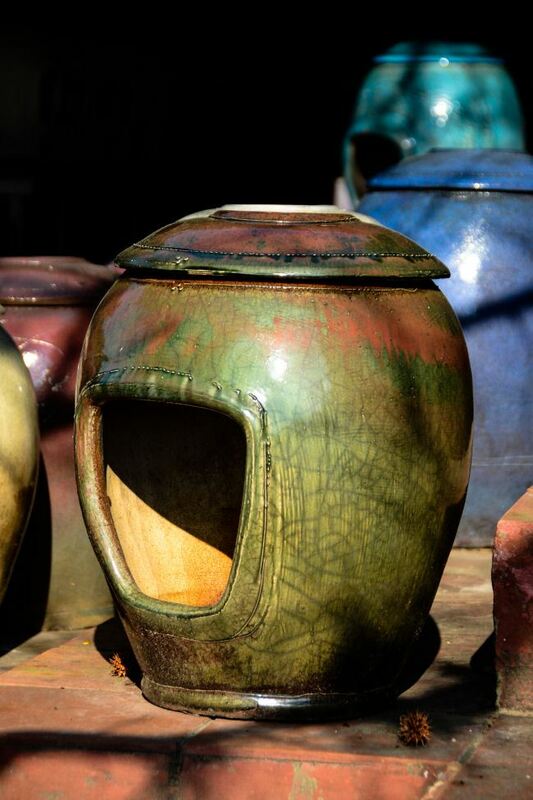 The organic nature of the Raku process makes each pot unique . In 1995 Hot Art registered as the designers and manufacturers of freestanding ceramic fireplaces. 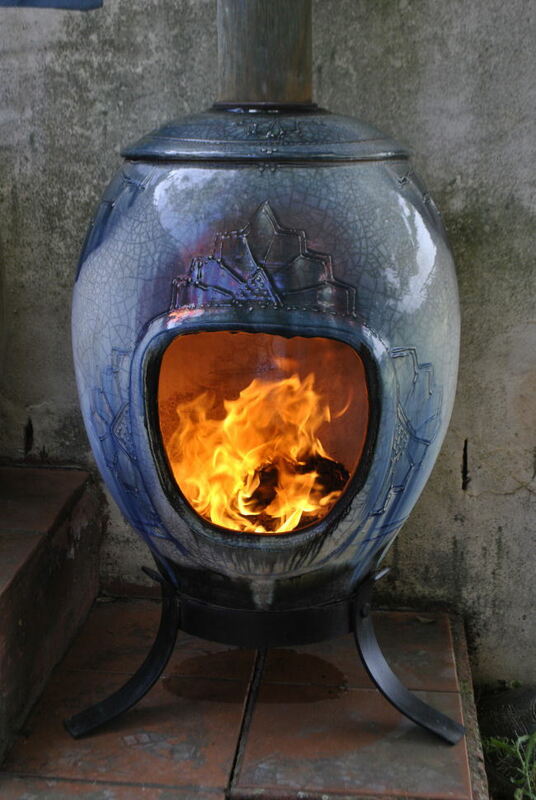 They are not only beautiful works of art, but are the most efficient fireplaces you can find (on the market, anywhere in the world), because the 12mm ceramic walls of the pot absorb heat rather than conducting it away rapidly, as does any metal fireplace, it can radiate up to 30kw of heat (tested by Popular Mechanics) as opposed to 17kw maximum from a metal combustion fireplace. With this phenomenal potential, the fireplace becomes self cleaning, there is minimal ash residue, and the excellent draw of the pot means there is no after-fire smell or odours. Essentially wood burning, this stove radiates heat long after the fire has gone out. Our pots come with a 2 year guarantee, against a faulty clay mix, but not from handling cracks. We consider our pots like tea pots rather than like metal kettles. If wood is constantly thrown into the pot, it will eventually register too many knocks and crack. It will still continue to function without affecting the performance of the pot. We have very specific instructions to help conserve the life of the pot, which obviates the primary cause of cracking. We manufacture the ceramic fireplaces by pressmouldiing a clay body that is designed to have 0% thermal expansion, which took 2 years to get right. We have manufactured almost 6 000 pots to date and Lesley-Ann decorates all of them with finishing lines, and about 50% get individualised decor, pictures and designs. Business hours are between 8:30 and 4pm, and this is when the Hot Art office is open and the employees are in the fireplace production studio. 99% of the pots are glazed and therefore are easy to keep spotlessly clean on the outside. There are two sizes, the large is 650mm x 510mm (height by diameter) and the small is 570mm x 460mm. The small one is famous for heating a single storey, three bedroom, open plan house by seven degrees in ten minutes. Both pots put out a similar heat of 30kw. Pots can be plain or decorated with Lesley-Ann’s slip trail designs and details. The pots are then glazed and fired to the specific cycle which renders them fireproof. Thereafter they can be further enhanced by a second firing in a gas fired kiln – this is the raku firing. We can achieve reduced copper reds this way as well as the typically oriental crackled effect, by fast cooling and smouldering in sawdust, then dousing with cold water! This is always a good check that the pot is completely fireproof. If you would like to see how it's done, visit us!